Cathy and the Cresents (CW) Sparky Harris, Bill Roy, Gail Heeringa Szotko, Pete Garza and Denny Heeringa. This photo was supplied by Gary Hunt. The Early Years: Sparky Harris AKA Al or Buddy Heeringa. 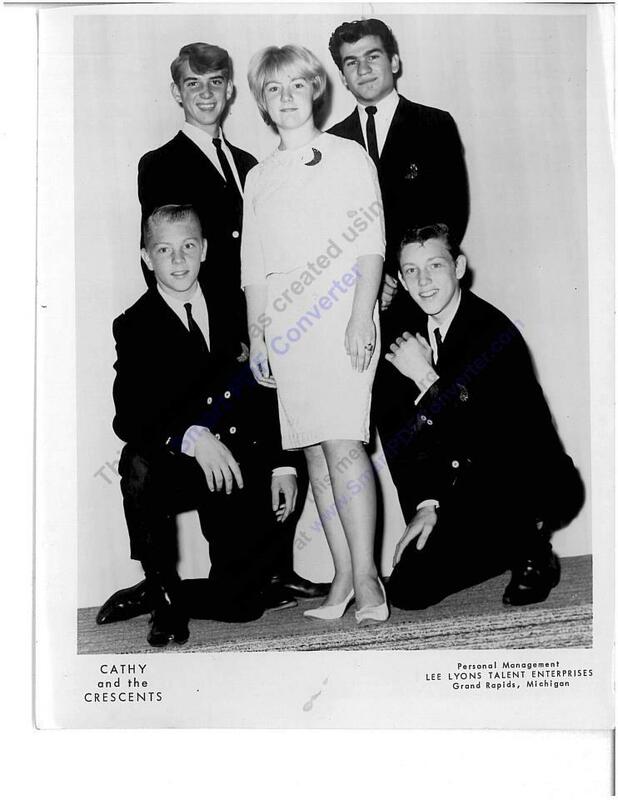 Says the band Cathy and the Crescents (“63 – 68”) was a family band with sister Cathy (Gail) (Vocals, keyboard) Brother Denny (Bass, vocals) Sparky (Rhythm guitar, vocals) Bill Roy (Drums) Pete Garza (Lead guitar). All were from Central High School except Bill Roy who was from Forest Hills. I saw Cathy and the Crescents while station at Ft. Knox, Kentucky in 1968. Any chance it’s the same group ? Cathy sang ” The Letter” and everyone loved it. It is good to find places like this that are wealth of information on bands from our past. Sparky Harris is still playing today with Christy G and Velvet and the Legends band. I really like your web site. Just added a photo of Cathy and the Crescents supplied by Gary Hunt. Would like your help identifying the members of this band! Thank you!